If you’re new to Cookie Madness, here’s a cookie you might have missed: Hard Boiled Egg Cookies! I pulled it out of the archives today since Easter is afoot and chances are you have some hard boiled eggs lying around. Plus, is it me or are there more features than ever right now on how to boil a perfect hard boiled egg? I know it’s Easter, but this year just about every food magazine and web site seems determined to teach me how to make a perfect hard boiled egg (which is good because I always forget how many minutes to boil the egg and how many minutes to let it sit covered). Anyhow, this cookie and its variations were developed a few years ago by me, Katrina and Rita after Rita mentioned that certain European style butter cookie dough was made with hard boiled eggs. 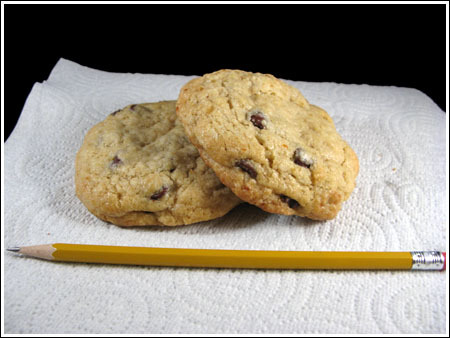 This is the original recipe for Amazing Hard Boiled Egg Chocolate Chip Cookies. Combine flour and butter in food processor. Pulse until mixture is mealy and coarse. Add the salt and baking soda and pulse to mix. Add both sugars and hard boiled egg. Pulse again until mixture is mealy looking. Add in the vanilla and pulse until mixture just begins to come together. Dump mixture into a bowl, add chocolate chips and shape into two balls. You will see egg whites in dough – they’ll disappear as the cookies bake. Bake on a parchment lined cookie sheet at 350 degrees F. for 20 minutes or until cookies appear lightly browned around edges. Let cool on cookie sheet for 5 minutes then transfer to rack to finish cooling. And here are some variations. Pulse flour and butter in food processor until mealy. Add the oats and pulse to mix. Add the salt, baking soda and cinnamon; pulse to mix. Add both sugars, honey, vanilla and egg and pulse until mealy. Dump into a bowl and add raisins and walnuts. Form into four large balls and bake at 350 degrees F for about 20 minutes (or until set). Shape the dough into two big balls — it should stick together easily. The balls will look gross and have flecks of egg white and maybe yolk – don’t be alarmed. Bake on parchment lined insulated baking sheet for 20 minutes. Let cool on cookie sheet for about 5 minutes then transfer to a rack to cool completely. These cookies are best dealt with once completely cool. First, we came up with a chocolate chip. It was a big, soft, dense (not cakey) and perfect for wrapping individually as gifts. The oatmeal was good too. Again, soft. These are the kinds of cookies that would make a great base for ice cream cookie sandwiches. To get an accurate calorie count you can add up the calories in the ingredients and divide by 8. I remade your recipe for chocolate chip cookies to suit my allergies…now they’re whole wheat and soy/dairy free. They’re in the oven.. 8 smaller ones. What’s the calorie count for your recipe? These cookies are awesome. Really rich and flavorful. We used crushed up leftover Easter candies (Cadbury robin eggs, M&M’s, little chunks of Easter bunnies) They would definitely be chocolate-ier if made with chips, but they were so pretty this way. Also, how cool is it to be able to eat the dough and not have to worry about raw egg. Love it. Hey guys! Thanks for these recipes. Here is what is going on at my house with cookie recipes: brown the butter, toast the flour and now, hard boiled egg yolks! Man, have I created some cookie monsters! How about posting some of the East European sugar cookie recipes that have the hard boiled eggs in them? I would love to have some! Holy cow….this is so cool! Who knew? I think they are the perfect accompaniment to an egg salad sandwich! Deb, thanks for trying the cookies and writing a review! I really appreciate it. Courtney, thanks for testing the smaller version! Katrina tried it as well. She made smaller cookies and baked them at 500 for about 5 minutes. Okay, I baked up a batch of the chocolate chip recipe today and shaped the dough into eight balls. The cookies baked up great and looked similar to your picture–they were nice and sturdy, not flat at all. I think the size was still a generous sized cookie and that they tasted great! 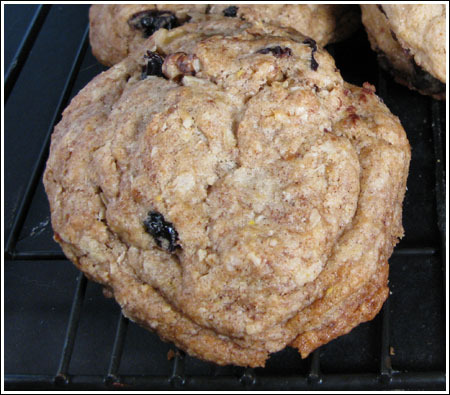 I also think these would be a good cookie to make and give as gifts because of the nice size and texture. Courtney, I’m sorry the yield is so small. The recipe is so easy you could just make the dough over and over (you could probably double it, but I haven’t tried tripling it yet) and just make a bunch. I think making the cookies smaller would change the texture somewhat. Maybe you could make a test cookie and let us know? I just got some hard boiled eggs today so I want to try this recipe (finally)! My question–do you think I could make the cookies smaller for a greater yield or would that ruin the texture? I just got some hard boiled eggs today so I want to try this recipe (finally)! My question–do you think I could make the cookies smaller or would that ruin the texture? Found this on another site and tried it -it is perfect!! 1. Combine the salt, vinegar, and water in a large pot, and bring to a boil over high heat. Add the eggs one at a time, being careful not to crack them. Reduce the heat to a gentle boil, and cook for 14 minutes. 2. Once the eggs have cooked, remove them from the hot water, and place into a container of ice water or cold, running water. Cool completely, about 15 minutes. Store in the refrigerator up to 1 week. Sue, I like the chocolate chip! I think Katrina likes the oatmeal best (and now I see the comment that confirms it). Katrina, thanks for the link. Sue–you should try these! Any version is good, but I do like the oatmeal ones the best for some reason. Wow! I never would have thought you could use hard-boiled eggs in a cookie. The oatmeal ones sound delicious! Which variation is your favorite? 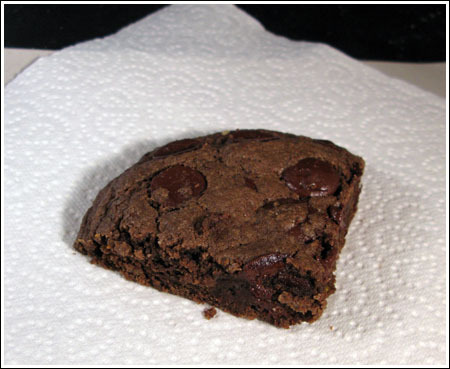 I like the looks of the double chocolate cookie best. I’m sorry to say I never got around to trying these.